To walk through the pages of history. To find yourself on those very streets and squares, that you have once read about in school textbooks. To visit the very place where Caesar was killed. 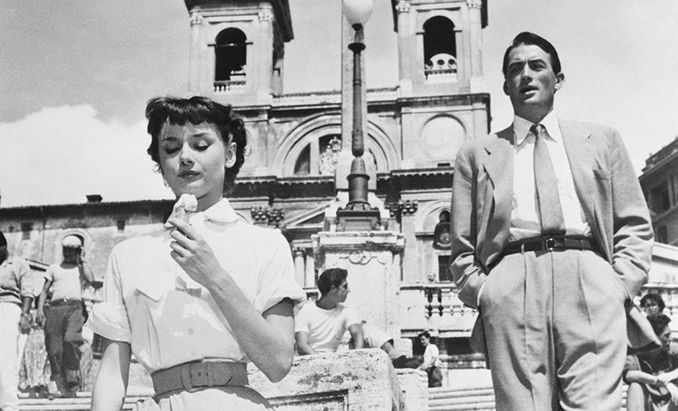 To sit on the stairs where Audrey Hepburn ate ice cream in the Roman holidays. To see the Pope. 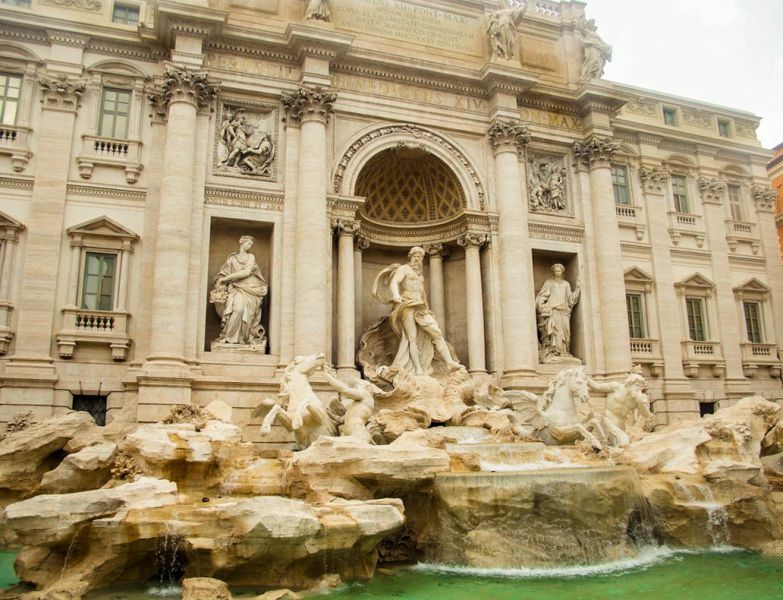 And this is only a partial list of our must see in the Eternal City. Having walked the most famous streets of Rome, we have prepared the ideal route to see Rome in 3 days. Why three? One day is not enough. You will only manage to do a selfie on the background of the Colosseum for the check in "was in Rome". It will be very hard to fit everything in two days: you will have to sacrifice something and will be knocked off your feet. But three days in Rome will give you an opportunity to see the most famous "sights" and not get bored of immersion in history and walking. This is our first time in Rome. And so we will be unoriginal: we will go to the places filled with millions of tourists with selfie sticks. Into the heart of the ancient city. You can see it in a couple of hours. But only if you do not go to museums and run very quickly through the streets. And taking into account the queues and time to get acquainted with the local pizza, you will spend the whole day exploring a small part of the city. 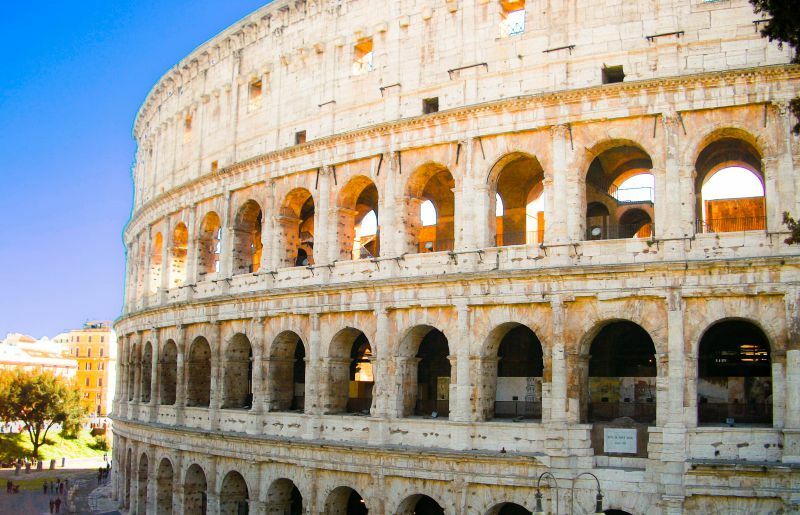 Start your acquaintance with the ancient city with the most important: go for "bread and circuses" to the giant-coliseum! The largest Roman amphitheater and the place of the bloodshed of gladiators. In ancient times it contained 50 thousand spectators! And when you will be impressed by the power and grandeur of the amphitheater, imagine: the Romans erected the Colosseum in just 8 years! It is impossible to believe! And now it is one of the busiest places in the city. Tip: you will have to "faint" not only from the majesty of the Colosseum, but from a huge crowd of tourists. If you have decided to go inside – get ready to stand in line at the cash register. You can be wiser. There is a single ticket, which is valid for 2 days to visit the three Roman sights – the Colosseum, the Roman Forum and the Palatine. You can buy it not at the gates of the Colosseum, but from the side of the Forum, where there are much smaller queues. Admission. Adult ticket at the ticket office – 12 euros. Online (to avoid queues at the box office) – plus 2 euros for the service. Ticket with a discount – 7,5 euros. For children and teenagers under 18 – free admission (reservation of a free ticket in advance on the Internet is also 2 euros). On the first Sunday of every month – free admission. Opening hours: the Colosseum starts its work at 8:30. The closing time depends on the season. In the summer – until 19:00, in October – January – until 15:00. You can buy a ticket 1 hour before closing. How to get there: line B, metro station Colosseum. Line A, metro station Manoni, then tram № 3. Bus № 51, 75, 85, 87 and 118. Address: Piazza del Colosseo, 1. We leave from the Colosseum – and here it is, the place from where the Eternal City began its history. Palatine was the first among the seven famous hills, which was built up. Right here, according to legend, the Capitoline Wolf fed the founders of Rome. The Palatine was the dwelling place of the nobility: only the rich and emperors could build houses here. Ancient temples, luxurious palaces ... Having climbed to the top, you are amazed at the grandiose scale of the ancient city! How to get there: in fact, the Palatine and the Colosseum are one complex: when you approach the Colosseum, you will be able to see the Palatine. It will take 5 minutes to get to it, while enjoying the grand panorama. How could you pass by the most famous arch in the world? 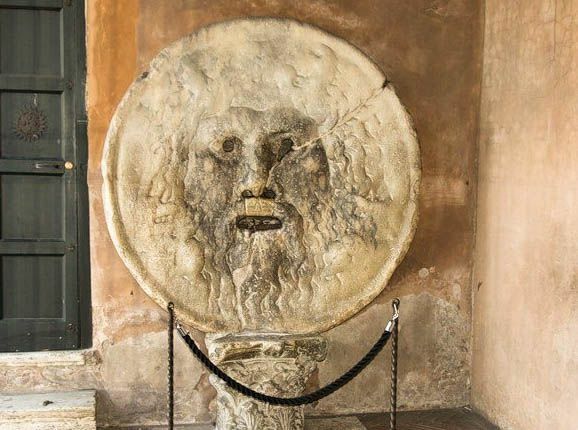 You should come closer to it to get a good look: it is perfectly visible from the top of the Palatine, and walking along the Roman Forum, you can come at almost an arm's length. This visit cannot be separated from the Coliseum and the Palatine. The heart of ancient Rome started beating right here. Earlier on this place there was the central market, shopping arcades and the life of the ancient city was boiling here. People elected consuls and passed laws. Until now, the Roman Forum is full of attractions. The Holy Road stretched along it, and Roman legionaries returned home. Just imagine, all this for thousands of years was buried 20 meters under the earth. 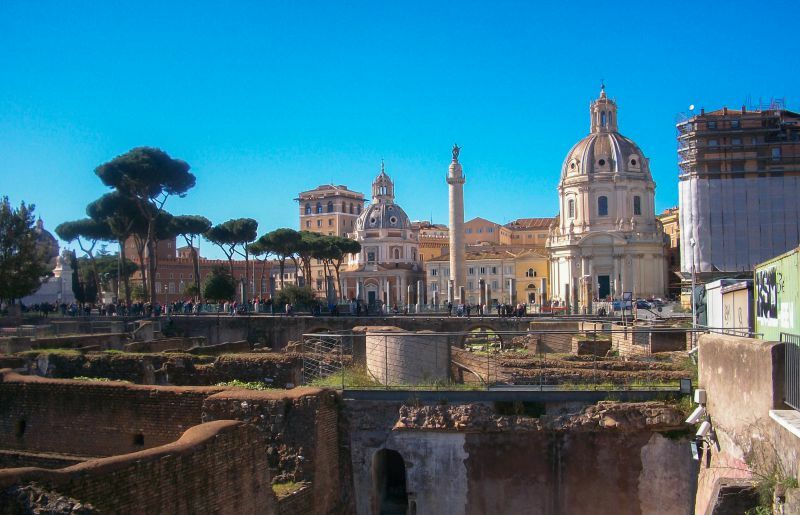 The heart of ancient Rome was dug up only in the last century! You can walk around here for a long time: it took us at least an hour. Opening hours: from 8:30 to 17:00 daily, and from March to September until 19:00. How to get there: 5–7 minutes walk from the Palatine – it is a single complex. And now we are going up, following a crowd of tourists. We go for about 10 minutes, along the way we see a source of water – do not throw away empty plastic bottles, you can refill them. And now look to the right. 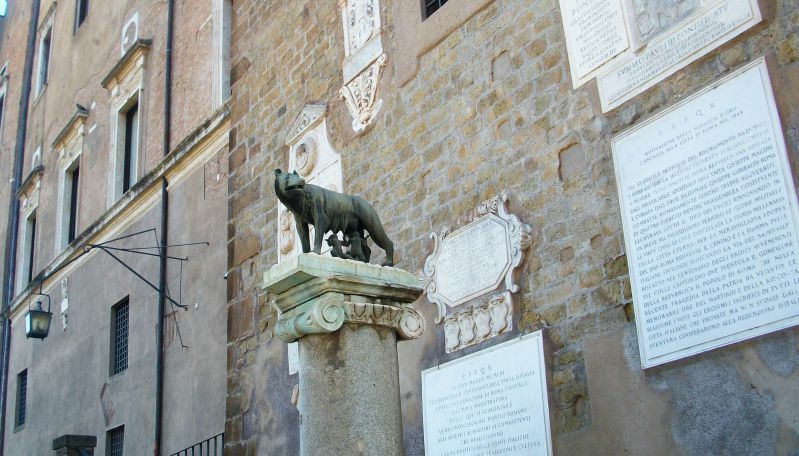 Remember the Capitoline Wolf, who nurtured the founders of Rome – Romulus and Remus? So here it is! 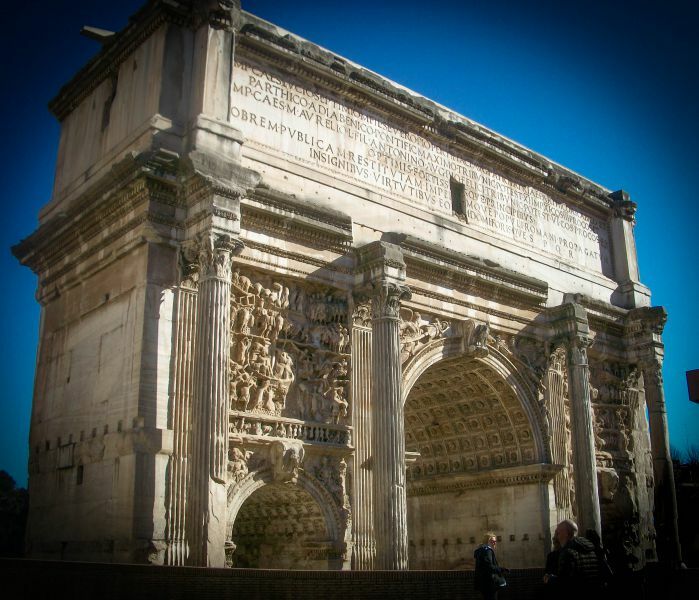 A symbol of the divine origin of Rome! Just a little climb up from the Roman Forum! The Capitoline Hill is one of the seven hills that were the basis of Rome. You will be greeted by the equestrian statue of Marcus Aurelius and the Egyptian lions at the foot of a grandiose staircase. The magnificent Basilica of Santa Maria in Araceli and the Capitoline Museum. And it is a perfect resting place after a few hours of walking: we settled comfortably on the warm stairs of the basilica – they are used by everyone instead of benches. Admission: visiting the square and the basilica is, of course, free of charge. If you want to see the museum, prepare 16 euros. It is open daily from 9:30 to 19:30. How to get there: line B, metro station Colosseo. Buses № 30, 51, 81, 83 to the stop Ara Coeli-Piazza Venezia. Tram № 8. How to get there: walk for 10 minutes from the equestrian statue of Marcus Aurelius: go down from the Capitoline Hill towards the embankment, staying on the left side. If you are going from another point of the city by transport, then you need to reach the Circo Massimo metro station, line B. Buses № 51, 81, 85 to the stop Bocca della Verità. Address: Piazza della Bocca della Verità, 18. We go along the busy Via Luigi Petroselli for 7-10 minutes to the noisy piazza. In Rome, as in all of Italy, you will find many piazzas. In Italian it means a square. You will find one of the most important at the foot of Capitoline Hill. Just go down from the statue of Marcus Aurelius. Horse-drawn carriages, sellers of selfie sticks, buses, rushing cars, crowds of tourists ... This is one of the starting points for many routes and meeting places. And the best panorama of Rome. The square is decorated with a monument to the first King of United Italy – Victor Emmanuel. It is impressive with its scale. How to get there: to Piazza Venezia there is a tram № 8. Nearby there is the Colosseo metro stop (line B). Buses 40, 44, 46, 60, 62 and others. This is a major traffic intersection. Opening hours: the National Museum of Palazzo Venezia works every day, except Monday, from 8:30 to 19:30. The ticket price is 5 euros. Prepare coins and get ready to meet your destiny! After all, this is the most romantic fountain in the world! And the most profitable: every year the communal services are fishing out of it about 1.5 million euros! You should throw a coin, while turning your back to a fountain. Throw once – you will return to Rome, twice – you will find love, three – wedding will be unavoidable. Near the tourist Mecca there are so many people that it is necessary to make your way to Neptune, who is driven in a chariot-shell. The water in the fountain is a fascinating color, but do not try to freshen up in it: a fine is a couple of hundred euros. The place is really great. But we did not want to stay too long: too many neighbors on one square meter. Tip: the fountain is the most beautiful in the evening. On holidays and weekends, get ready for the fact that a small square is filled with people. How to get there: boldly walk along Via del Corso and turn onto Via delle Muratte. It will be a lot of fun, strolling along the narrow picturesque streets. The first day ended at the most romantic fountain in Italy. Further it gets even more interesting. We will show what you can see in Rome in three days, enjoying a walk around the city. Today we will continue getting acquainted with the center. There are so many more interesting things! It is necessary to stroll through the narrow streets of the city, so noisy and ancient, in order to take the atmosphere of the city with you. Yesterday we were walking quite a lot, so today we have a more relaxing program near fountains and shops. You will not be able to pass by one of the central squares and the most famous streets of the city spread out from it. One is crowned with a 3-meter obelisk, praising the deeds of Pharaoh Ramses. Once upon a time the heads of executed criminals rolled on this square. But today it is one of the starting points for a walk around Rome. And the square of ​​fountains! How to get there: the nearest metro station is Flaminio. A fashionable street that attracts shopoholics from the whole world. Elite boutiques, expensive restaurants and noisy entertainment – the street is boiling during day and night. It stretches for many kilometers, starting from the Piazza Venezia. But the most interesting thing for us was to stray from this route and wander through narrow neighboring streets. 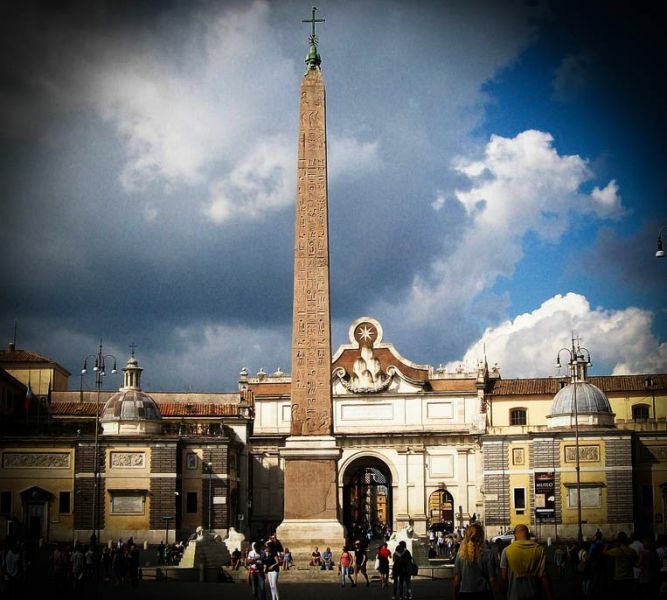 How to get there: choose a middle "ray" from Piazza del Popolo – and you are on Via Corso. The nearest metro station is Flaminio. Another cheerful crowded place. 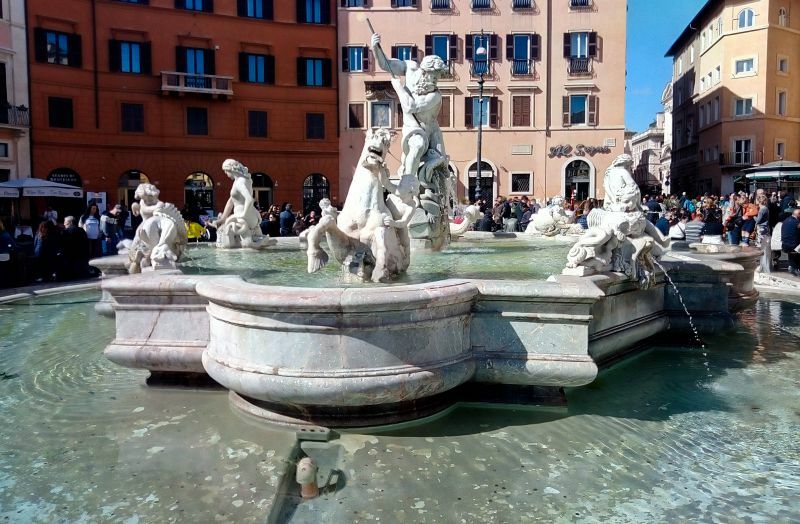 Everyone is eager to go to the fashionable Piazza Navona to make a selfie near the Fountain of the Four Rivers. But there are also smaller fountains: of Neptune and Moor. Everyone is waiting in the line to make a photo with fountains, there are a lot of people, music is playing – a lively and cheerful place. How to get there: in a 10 minutes walk from Corso there are the nearest metro stations – Barberini or Spagna. You can reach the Vittorio Emanuele stop by bus № 64. House without windows and doors. Well, there are doors in the Pantheon, but there really are no windows. This is how this temple was built, which was originally pagan. 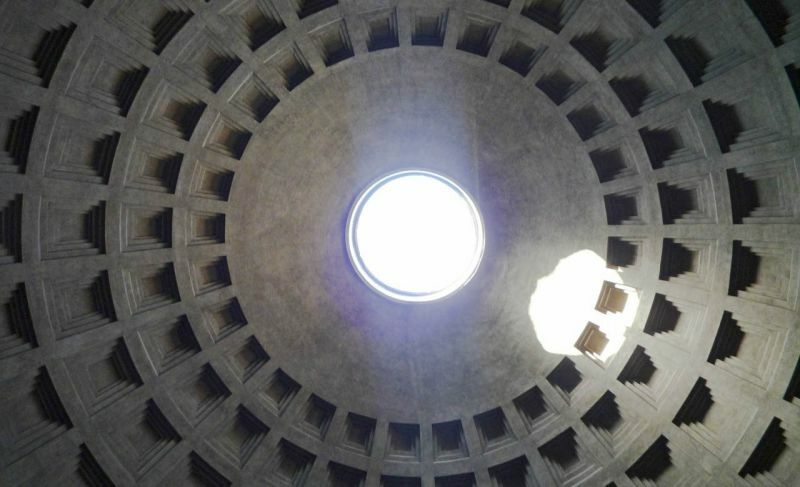 Light breaks into the twilight of the Pantheon through a 9-meter hole in the dome – the oculus. It symbolizes the unity of all deities – the all-seeing eye. The hemispherical dome of the Pantheon is ideal, its width is more than 40 meters! Walls of 6-meter thickness were erected to support this weight. In the past, under the "eye" there was an altar, and near the walls – statues of the gods. Light in turn fell on each "god", as if giving each of them the honor. Opening hours: from 9:00 to 18:00. There is no entry fee. Prepare to stand a kilometer queue in order to look at the interior decoration. How to get there: walk from Piazza Navona to Via del Salvatore takes 5 minutes. If you are getting there from afar – walk from the metro station Barberini. Relax a bit from a walk through the Eternal City. Go to the Piazza di Spagna and take a seat on the steps. Eat ice cream! Just like Audrey Hepburn in the role of Princess Ann. The events of the legendary film Roman Holiday took place right here. It is not strange, because this is an incredibly beautiful Baroque staircase, which is always filled with people! We came here in the evening, and still it was one of the main party places. How to get there: a walk through the streets of Rome takes 15 minutes. The nearest metro station is Spagna (line A). It is time to go to the smallest state in the world. You do not need any visas to get into it. You do not need to go through borders and customs. The Vatican is located in the center of Rome. You can walk on foot. You just need to cross the bridge across the Tiber River. And you are in its heart. You are in a microstate that is populated by a thousand of people, mostly ministers of the Catholic Church. We have put off the Vatican for a dessert. Perhaps, the most intense day. Everything is very compact. And if not for the queues, you could have seen everything very quickly. Huge queues of people eager to get inside the majestic cathedral are on St. Peter's Square. For this you need to go through a metal detector. And then have patience and wait. But the majestic square will not leave you disappointed, you can admire the fountains and Baroque buildings. There a lot of people who came to look at the Basilica or the Pope. We have not seen such long queues yet. How to get there: the nearest metro station is Ottaviano. You can get there by bus № 40. How to see the Pope? Millions of people come to St. Peter's Basilica in hopes of seeing the Pope. It is possible not only on public holidays. The pontiff appears on Sunday and Wednesday (if he is in Rome). It is necessary to follow the schedule on the official website of the Vatican. If you go to an audience with the Pope on Wednesday or want to take part in liturgical celebrations, you must take care of the ticket in advance. All tickets are free. They can be reserved on the Vatican website, request by fax: +39 06 6988 5863. The form on the site can be temporarily not in service, the fax is often busy. If the group is less than 10 people, it is easier to take the ticket from the guardsman near the Bronze Door. They are issued on Wednesday from 15:00 to 19:00 (until 18:00 in the winter). Or on the day of the mass from 7 to 10 am. 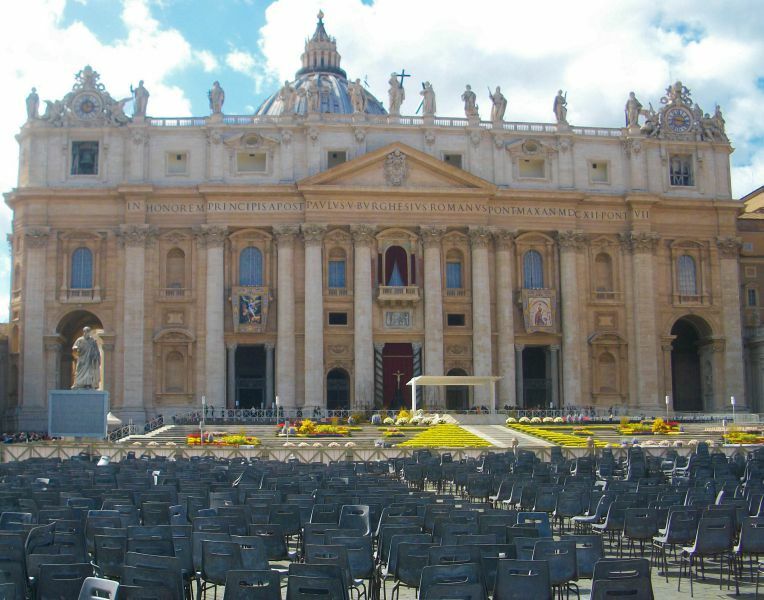 But to participate in the Sunday prayer, you do not need tickets: just come to St. Peter's Square. The dome of St. Peter's Basilica is the highest in the world. Its height is 136.5 meters! From the top you can see a magnificent view of the Vatican and Rome. To visit the Vatican and the dome, plan at least 3 hours. Admission: there is a fee. The price is 8 euros using the stairs and 10 euro by elevator (rise to the middle of the way). This is an adventure for the strong in spirit, but the panorama is worth it. It is extremely tiring to visit everything in one day. In the museum complex there are more than 30 expositions! Usually tourists focus their attention on the "precious casket" of the Vatican – the Sistine Chapel. It is fascinating! 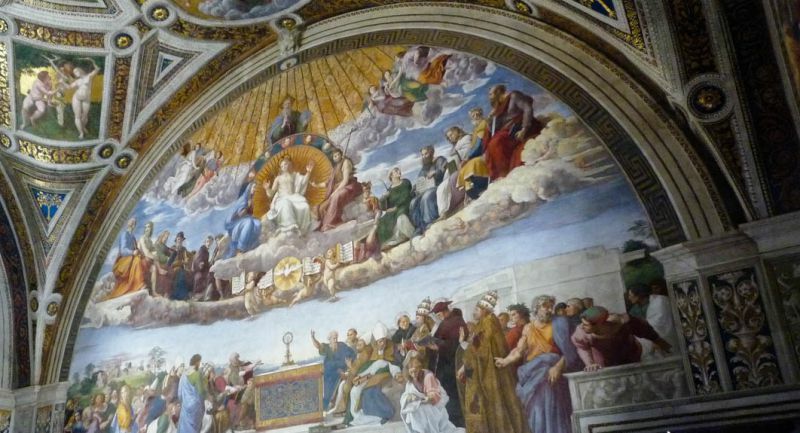 The grandiose ceiling is decorated with frescoes by Michelangelo. Others opt for the Pio Clementino Museum and Stanze of Raphael. If you have enough time and energy, you can expand the program. There are 4 routes to choose from. If you have strength and inspiration, go into the Vatican Gardens. But you can get there only with a guide. Admission: you can go to museums free of charge on the last Sunday of every month. But get ready to stand in the huge queue. You need to arrive early, before 12:30. On other days the ticket price is 17 euros. You can buy tickets online (reservation is 4 euros). You need to print the voucher that will be sent to your e-mail and show it at the entrance. This way you can avoid the queue for buying tickets. On Fridays, from 19:00 to 23:00, night excursions are arranged. If you want to visit the gardens, book a ticket on the Vatican website. The price is 33 euros. This includes a visit to the museums, but without a guide. How to get there: if you did not buy a ticket, you need to stand in the queue to the cashier from the side of Vaticano street. 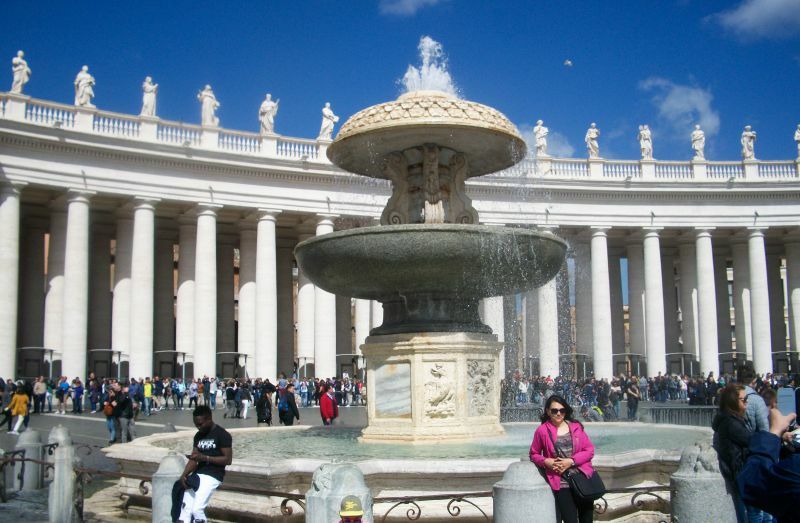 It is more convenient to walk from the Ottaviano metro station or from Piazza San Pietro. If you have a voucher, it is better to get to the entrance from the Cipro metro station. From Piazza San Pietro get to Piazza del Risorgimento and walk for about 10 minutes on foot. In Rome, there are a lot of bridges across the Tiber River. We will focus on the two most beautiful. You will certainly see them when you go to the Vatican. Ponte Sant'Angelo is one of the oldest pedestrian bridges in Rome. It is decorated with statues of the apostles Peter and Paul. And with a lot of angels – you can read a lot of amazing legends here. Nearby there is another pedestrian bridge – Vittorio Emanuele II in Rome, which is decorated with bronze statues and the Winged Victory. How to get there: exit St. Peter's Square and turn towards the embankment, along Via Sam Pio X. The road takes 5-7 minutes. If you are traveling from a different point in the city, then you need to get to the Lepanto metro station (line A) or by buses № 62, 40, 23, 271, 982, 280 to the Piazza Pia stop and № 46, 64 to Santo Spirito stop. The most beautiful panorama of the Vatican opens from the roof of the castle: you can see St. Peter's Square and the Basilica as if it is on your palm. Of course, you can climb up, only after having to stand in the huge queue. An interesting legend is associated with the castle. In the 6th century, a plague came to Rome. Pope Gregory I led the procession, praying for the salvation of people. He had a vision: Archangel Michael, hovering over the castle, had put his sword in the sheath. This was interpreted as a favorable sign. And the terrible disease really receded. And also, the astronomer Giordano Bruno was kept inside the walls of the Castel Sant'Angelo for 6 years. How to get there: just walk along the embankment for 5-10 minutes. The nearest metro stop is Lepanto or Ottaviano-San Pietro. Admission: entrance ticket – 14 euros. Opening hours: from 9:00 to 19:30. This is how we found ourselves on the embankment of the Tiber River. Let's go down and, finally, relax a little after three busy days. And then we'll go and sit in some cozy restaurant with Italian pasta and wine. And we will definitely get a souvenir from the Eternal City to remember the lovely Roman holidays. If you are interested in what can you take away from Rome, how can you travel around the city by transport for cheaper, how much will you spend on housing and useful life hacks – you can read about it in our article. Photo author in the article: Elena Yaremko IGotoWorld Photo Group.